From a single Sauvignon Blanc vineyard on the Sondagskloof property. Very aromatic with notes of fynbos, elderflower, lime and white peach. 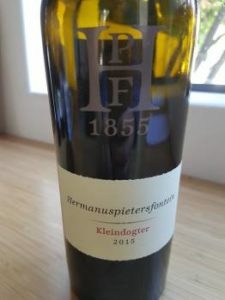 The palate shows concentrated fruit and zesty acidity with some white pepper bite to the finish – a very striking rendition of the variety. A blend of 52% Sauvignon Blanc, 34% Semillon, 10% Chardonnay and 4% Nouvelle. Fermented in barrels of various size before maturation lasting 11 months in 3 500-litre foudre. Citrus, green pepper and green bean on the nose. Lean and angular on the palate – arresting but ultimately a bit disjointed. From Semillon. Spontaneous fermentation in older 500-litre barrels before 11 months of maturation. Pronounced but not entirely unpleasant reduction before lime, white peach, green melon and some herbal character on the nose. Pleasantly lean and austere – alcohol is a modest 12.2%. Next articleSubscribe to our newsletter and win!